Engineer – The role of technical founders typically starts by defining and building the product. You’re in the code all day long. Manager – One morning you wake up and realize your whole day is meetings. You find yourself managing 20 or 50 people, buried by one-on-ones and constantly recruiting. Executive – You finally manage to bring on a fantastic VP of Engineering or technical leadership team. But now you’re confused. How do you continue to move the business forward with same momentum? This article is about successfully making the transition to that final phase. There’s not a lot of help available either. While there are plentiful resources (books, talks, workshops) to help people become better engineers or managers, later-stage CTOs have no one to turn to but each other. As a result, they end up relying heavily on others' experience because the answers are nontrivial and not widely known, and the right thing to do hinges on which stage your business is at. At First Round’s recent CTO Summit, Cooke set about liberating this knowledge for the audience of technical leaders, walking through the unique situations facing later-stage CTOs like himself and offering advice for surviving the role’s biggest pitfalls. They under-communicate critical technical challenges to the non-technical parts of the business, and don’t do enough to get the entire company on the same page about technical issues and roadmap. They unintentionally leave people in the dark. While they may not have said “no” enough when they first started, they now say it too much. They focus too much on delivering against their plan and not enough on adapting to the needs of the business. They fail to transition into an environment that requires long term planning and more predictability on staffing, quality and delivery. They make poor senior hiring decisions. The skills needed in great product contributors don’t necessarily translate to recruiting managers and executives. Finally, they fail to make effective use of their time — which they ironically probably have much more of than they did during other points of company growth. Cooke broke down two of the most serious root causes and the opportunities technical leaders at later-stage startups need to navigate. Here, he provides a cheat sheet for not just surviving this sticky phase, but thriving all the way through it. Root Cause 1: You don't know your fellow leaders well enough. Management teams start to come together in more formal ways between Series A and Series B funding rounds at venture-backed startups. Suddenly, people are elevated to represent different departments and functions within the business from marketing to HR to product. “One of the challenges I faced as our business grew was not realizing that this change had happened and setting up these meetings and building these relationships too late,” Cooke admits. So what should you do to make the most of meeting with your peers on the leadership team? The engineering and technical organization can start to seem like a black box to other parts of the organization like sales and marketing as a company grows. What used to be common knowledge and shared between functions of a company is often lost without an explicit effort to support those communications. As a technical leader, you have a unique opportunity to be an advocate for the product and engineering team within your company. Something as simple as communicating how the product and engineer teams set goals, prioritize work, and manage risk to other leaders can have an immense payoff — sales can better inform customers, marketing can better manage timelines and product and feature slips, the finance team can better understand budget requests, and the HR organization can design better ways to build a recruiting machine for and empower product and engineering employees. Understand what they need from you. Perhaps the most interesting byproduct of going out of your way to get to know others is that your own goals will become much clearer, Cooke explains. You won't know about many of the most critical challenges at your company unless you build the right communication channels. They find the right problems to solve. They don't just surface all of the ones they see. They know how to put challenges in the context of the business' success to explain why they’re crucial and need solutions. They know how to build a concrete, feasible plan for tackling these problems. They know how to communicate to various teams and the company about what is being done and why it's important. They are execution oriented and turn the plan into action. Refining your own perspective on what makes a great executive will help you find the best way to communicate and prioritize your and your team's work, but it’s also extremely useful in hiring other leaders into your company. The ability to abstract complex problems and situations and identify what’s truly important and actionable. Sensitivity to interpersonal dynamics and human psychology — this is immensely important for technical leaders. Humility. He or she clearly articulates lack of knowledge on unfamiliar topics and seeks to give rather than take credit. And, perhaps most importantly, unquestionable integrity. Any doubt that arises during reference calls should be taken very seriously. Root Cause 2: You misunderstand the needs of your company. As an example, Cooke points out that as a company enters the growth phase, the shift in focus for the leadership team and board can be very confusing for CTOs. Board meetings that used to involve hours of product and engineering discussions instead start to focus on sales and marketing or strategy. It can feel like technology issues aren’t being prioritized or that you're being marginalized. The reality is that the important problems faced by the company have changed. Your job as a technology executive is to understand and support that transition. 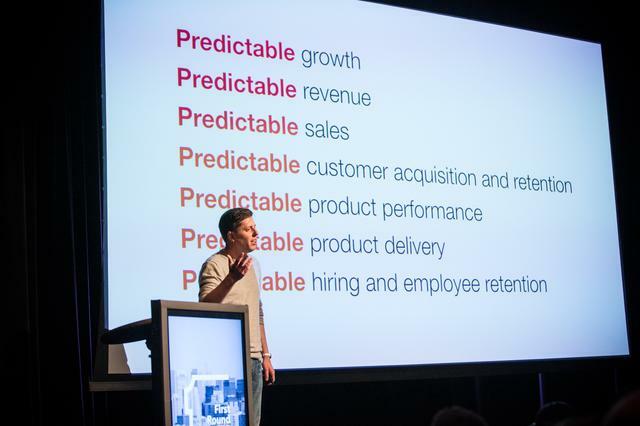 As you build a company, you're essentially generating predictability where it didn't exist. If you compare that with a large public company that regularly releases analysis and projections, you see the stark contrast. That business has to know how much revenue and growth it's going to generate several quarters in advance. Evan Cooke speaking at First Round's CTO Summit. Cooke highly recommends the book Startup Boards by Brad Feld and Mahendra Ramsinghani, not just for engineering executives, but anyone who aspires to leadership at growing companies. Having this global picture of what's important to the business overall is hugely helpful in prioritizing the needs of product and engineering. So even if you can't be present for board meetings, you can make a point of getting that information through other routes — by asking people who were there, by incentivizing them to share the takeaways of these meetings with the broader company through an all-hands or internal blog post, etc. Having access to the insights that come out of board meetings informs technical leaders about the challenges they're not only facing in the present, but that are coming down the pipe in the future. That's how you can determine whether you need more headcount, or how to structure your teams so you can handle accelerating workload or a diversity of products at once. Keeping focused on the true needs of the business and building great relationships with your fellow leaders is essential for helping technical leaders stay effective. Success in the early days means something different than at the growth stage of a company. As the organization changes, your goals and your expectations on your role must shift as well. “If I have one takeaway, it's that technical roles and especially technical leadership roles change dramatically over time — and you can often feel like you ended up where you began,” Cooke says. Just as the role of a technical founder can start in the code, later-stage CTOs may find their biggest impact back in the code. In his article titled #define CTO, Stripe CTO Greg Brockman described how his role evolved from an Engineer, to a Manager and back to engineer after he hired a VP of Engineering. This is the right path for some while for others it’s becoming a public voice for the company like Dr. Werner Vogels at Amazon. You probably started with no direct reports and a lot of direct decision-making responsibility, and you find yourself back there again. My message is: That's OK and is actually a sign of success.